The weather doesn’t seem like it yet, but it’s THAT time of year! We are gearing up for this year’s Holiday Gift Drive. Here are just a few FAQs about the Gift Drive. 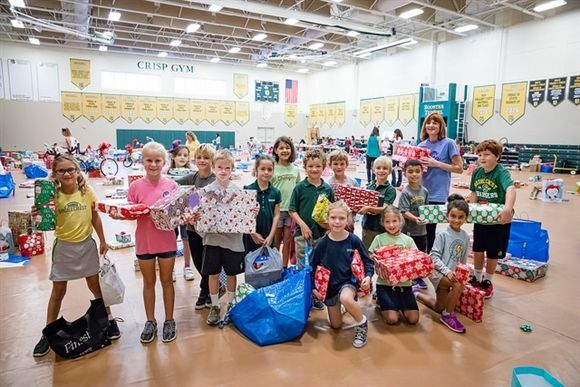 What is the Shorecrest Holiday Gift Drive? An opportunity for the Shorecrest Community as a whole to come together and provide for children in the local foster care system. SCA has partnered with the Guardian ad Litem Foundation in this project. What is the Guardian Ad Litem Foundation? MISSION: To provide advocacy and support for abused, abandoned or neglected children in the Guardian ad Litem Program of Pinellas and Pasco Counties. VISION: We envision a world where every child has a safe and permanent home and the opportunity to thrive. Over 2,000 children in Pinellas and Pasco Counties have been removed from their homes for no fault of their own and are living under court supervision due to abuse or neglect. Shorecrest has agreed again this year to purchase holiday gifts for over 200 children in the system. We will receive a master list that we will divide and provide specific items to a classroom or grade level. Your student will soon receive a wish list for a specific child that the class can shop for. You will be invited to participate by purchasing items off a Sign Up Genius or donating online so the SCA Committee can purchase items for the children. What will the lists from the children look like? There are many ways to participate in the Gift Drive. Volunteer to be a grade level liaison! Coordinate with your class, put the list out to them, remind them to bring in gifts. Participate as much as you can - it is amazing to walk into the gym and see the generosity of the Shorecrest Community on the pickup day! Volunteer on pickup day to wrap gifts, put toys together, or run to the store for last minute shopping. E-mail us at giftdrive@shorecrest.org with questions or to volunteer in any way.